I have no experience of this torch. I have had a number of torches over the years, mostly Petzl, from the old 9v through to the leds. I have had Black Diamonds, but they have a very confusing control system. I like a waterproof, dimmable headtorch with a red light function. The one I have been using for about a year is a Jetbeam HR30. It uses an 18650, and can be recharged in the torch. The headtorch can be removed from the carrier and used as a stand alone torch. If you need a lot of light you can ramp up the brightness quite impressively. I still have some Petzls. A micro in a survival kit and the Tactika which gives you the option of 3 colours, but the case has cracked by itself. The HR30 is more expensive than the wanderer however. For me having a red light on a headtorch is important, being able to vary the output is too. The Wanderer does have some ability to change the intensity, but having the ability to go very low (moon mode) is again useful and I cannot see that the Wanderer does that. Some idea of remaining battery charge is also useful which the HR 30 does, but cannot see that listed for the wanderer. From the images the battery back is at the back; although the old, and some of the new Petzls had this, it can be a nuisance if you want to wear under any sort of helmet and the wires themselves can fray at the attachment points, so just adds another area of failure. I had a petzl and it was great except the batteries went too flat too quickly, the elastic headband lost its stretch very quickly and the rubber over the on/off button perished. Don't like the wires and back battery but do like the usb charge option. After a bit of online research, I tried getting the Jet Beam HR30 but it was not in stock, so ended up ordering a Fenix HL60R which looks pretty much the same, if a little bit dearer. Thanks again, your comments really helped me hone in on what I wanted from a headlamp. I just reviewed what felt like every head lamp on earth, so I believe I am somewhat qualified to help! There are many good headlamps. You have to narrow down what you cant live without and what you can. For example water resistance, brightness, battery life, weight & then you have features, such as red lamp vision for not disturbing wildlife & stealth camping. My main considerations were water resistance, weight and battery life. I also have to have a red light and I prefer a simple interface (lamps can get ridiculously complex). In the end personal preference did play a part in what I chose, so I went with the Nitecore NU25 UL Headlamp (review below). I purchased through light-works USA & chose a black shock cord head-strap (they mod this for you so it is super light weight). You can buy it standard in Australia within your price range I think. Too not fall in love with this mini-powerhouse of a lamp is very difficult. Many have, me included. However, my main consideration in choosing a headlamp was, or should have been, battery life. IMO having a super-powerful headlamp isn't practical. Having said this most of the headlamps you look at are performance orientated, not adequate power and long battery life orientated. I use to use hurricane lanterns, often still do, & still got buy! In this case & if you wanted long battery life with adequate (modern) power levels, I would seriously go for the Petzyl Tikka. IMO, this is a highly underrated headlamp. It has incredible battery life- think cave exploring capability. BUT its not that water resistant & I insisted on that. Another very descent headlamp at a budget price (about $30). is the Vitchello V800. Waterproof to IPX6, & it has a red LED like you are after. This is a cheap quality headlamp. I am not sure if it has been updated however, as old specs seem a little dated. This is my brand new Nitecore NU25. Used it once. I keep it in a soap travel container. The CRI lamp is amazingly clear...! It also has a very bright red lamp, with 2 brightness levels, which I like for looking at nocturnal wildlife & stealth camping. Great review Edward. 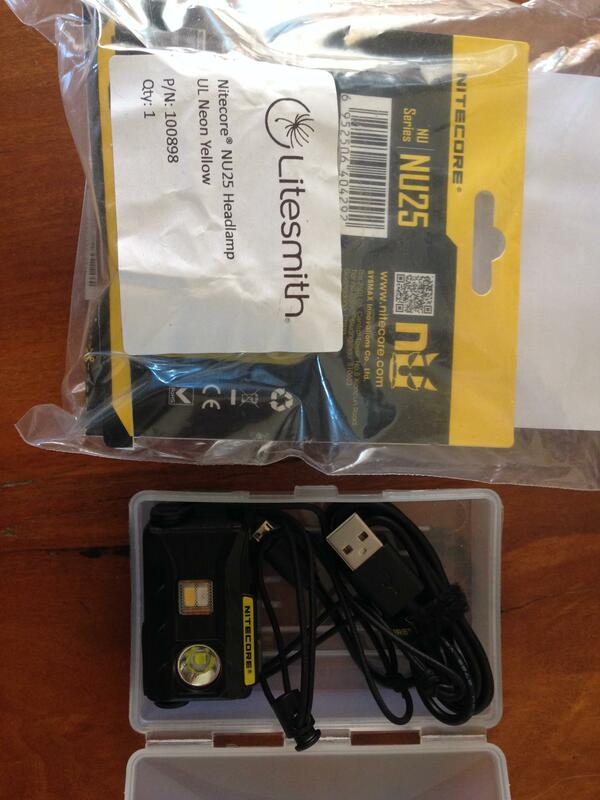 Nitecore have been very popular in the rechargeable battery crowd - high quality cheap intelligent chargers. I have 2 of their chargers. Red light is also good for YOUR night vision when you turn the light off, which is why military types use it ; you probably know this. Thanks Randall, the NU25 has one issue for me, that is significant parasitic drain. I’m not sure if you have found that to be an issue with your model? This is often a problem especially when you forget or cannot remove the batteries. My Aldi IR viewer suffers from this, but removing one battery from either side stops the problem. And I never use the copper topped batteries that power bunny rabbit toys, if left they always leak. Going in I was sceptical due to its size, but reviews have been positive overall. I assume you are referring to static drain, like while the lamp is in storage? Or do you mean drainage in use? I assume you meant in storage. I just tried it now and it is still extremely bright. This was after using it for about 1-1.5 hours 2 weeks ago after 1 full charge. So I don't notice any undue drain issues yet, at least so far. As you are probably aware, it also has a lock out feature as well as many lamps seem too now. Maybe you got a dud or something...? What are you using now, if anything? So far main usage has been with the hi CRE lamp indoors, while reading in bed at night. This is a flood beam, designed for use around camp. I have noticed no (in-use) drain issues whatsoever, even after using it for more than 1 hour. After my first charge I tested the light outside & inside for a few minutes and it is extremely bight for its size.Also no notifiable drain issues, but it was only for a short time on high. Going in, and as mentioned above, I really didn't want something like this. I wanted something that I could replace batteries with in the field. The reasons I chose THIS rechargeable lamp, even though I didn't really want one, is because of how light-weight it is and for the powerful red-light- always wanted one of these! I once spied a Tawny-Frog Mouth Owl in the NT while walking through mangroves, but I couldn't see it too well as the red light on my headlamp was too dim. Mind you this was when headlamps just hit K-Mart shelves in Australia & were affordable, it was an Energiser. Had I known about the high CRi globe the NU25 has I would have chosen it for that - I have never experienced anything like it - it is excellent! As mentioned above, I would be lying if I said I wasn't sold on the turbo boost power for the lamps size as well- I was. But I also thought this could be a positive as well, if I need to spot potentially dangerous animals around my campsite- don't laugh it has happened to me before. Another reason I chose a rechargeable headlamp is I considered getting a handheld GPS, or even use a rugged mobile phone to take into the field. This is something new too me. I was against this in the past, especially phones. However, more and more people are taking tech into the bush. I use to be against this, but have since been more open to it for various reasons. Reasons such as safety, the ability to read maps, have wildlife apps apps that have audible bird sounds, use phone as a GPS or compass, keep family & friends updated on progress, or even call for help in emergencies & of course use the phone as a battery pack to recharge my headlamp instead of taking battery packs (more weight). As you may know, the NU25 can be recharged while its in use if you wish. It also comes with a Nitecore USB charging cable for use with the car cigarette light port, which is good for car camping & travelling. I also usually take a hurricane lantern camping with me as well, so the headlamp is usually for chores, finding something or short night hikes. If I were to really go off the grid camping I would take something I could replace batteries with, or at least have a backup that I could like a Petzyl E-lite+ as batteries are light as a feather for those. But you probably know all this anyway. For now its lets just see how the NU25 goes- lets hope its not another novelty of wasted dollars! Sorry I couldn't be of more help, as the NU25 is a new light for me. I hope this helps/ makes sense. Thanks Eddy, it was the drain in storage I was referring to. Might be worth a test of runtime before you go. I don’t have one and I’m not a fan of batteries I can’t remove from a device, but understand why you went for this model. According to what I have read you will have 30secs of turbo before it cuts down to normal brightness, either to save battery power or as a thermal protection. With a week away coming up quickly, I decided to just get on with it and order a light online. Tried to get the lamp recommended above but it was out of stock. Speaking on the phone to the staff I was recommended the Fenix HL60R and decided to order it. I consider the mobile phone a piece of survival equipment when I'm out bush. I always have it off, to preserve battery life in case it might be needed. And there are some awesome uses and apps. One is the Emergency + app from the Australian gov. Emergency services love this - it gives your coordinates. GPS, as a backup; however I also use this as my urban gps for finding addresses (mostly in car). Backup torch light. Electric compass. Emergency first aid eHandbook! I'm not sure that you can use a mobile as a power pack. It's an awesome idea, I just haven't heard of it done. But, it can be used as a backup torch light. All those mobile phone zombies depend on this as their only portable light source . Most people (very dependent mobile folk) want a backup power supply for their phones because they can't imagine life without one for a nano second . I'd kind of suggest, if you're out bush, keeping your phone as a potential piece of emergency equipment. However nothing beats versatility. I hope you find a way of using the phone as a backup power source; again, it's an awesome idea, and the importance of light could precede the importance of contacting emergency services, or an associate for help. Another good use of mobile phone is if you're with someone else. Sometimes, my partner, decides to take a different route to that planned (it's always a mystery .) I always wait at track junctions, unless I think it is obvious. But sometimes, I've turned my phone on, and texted. She turns her phone off too, so I know she'll get the text as soon as she turns it on. We've also used phones like this on urban mtb explorations or in the bush for the few occasions that we've been separated. We do have a plan (back to last known track junction and wait; I backtrack), but if there is mobile coverage, it's easier. In reality though, I reckon your headlight will never need topping up when you're out bush. The headlamp, (FenixHL60R) ,showed up today right on schedule. Could not get it going, rang retailer and found out that the battery is insulated from the circuitry during transport, opened the battery cover and removed insulating disc and now it's working well. Light combinations bright and easy to use. Not too heavy and very comfortable to wear. At $119 including postage it's not cheap, but as my old man said, "Only a rich man can afford cheap tools." Will give a better review once tested in the field. But atm, it looks like a winner. Test drove it last night and the turbo beam is amazingly bright..no narrow focus: just lots of light.